Wow, Things have finally come together. For those of you who just want the highlights, we switched motors, set a new record, and are heading to Bonneville next week. These were completely hand made out of bolts, tubing and wire. 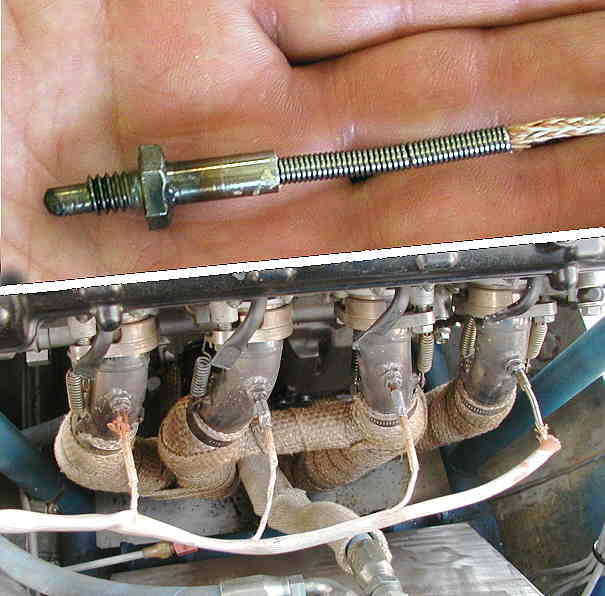 We even hand wound the strain-relief springs. 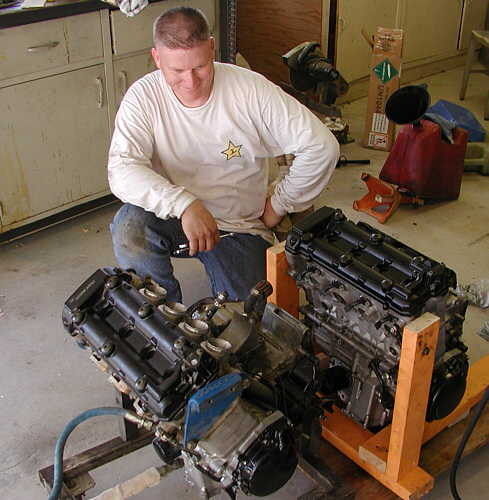 There are a number of reasons we switched to a bigger motor, one of them was that it would change our engine class, putting us against a lower, and thus easier record. Our new class is designated GGL or "Giggle" as some people call it. The first G is engine size 1500cc - 2000cc. The second G stands for Gasoline. And the L stands for Lakester. This is a change we had been looking forward to ever since we started building the car nearly 4 years ago. All of these changes went on over the last 3 weeks. 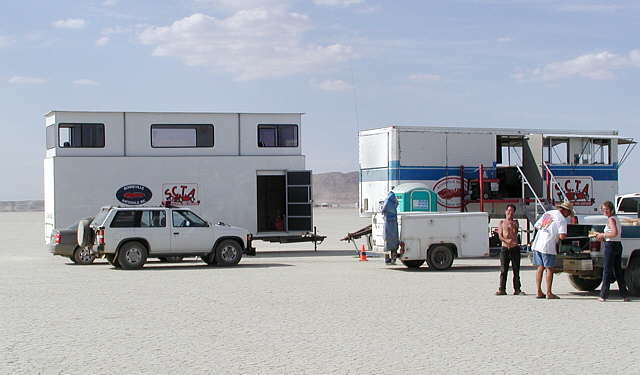 On Saturday Morning, October 4th, Mark, Alan and I drove up to the El Mirage lakebed setup our pits and easily got inspected. Then while Mark and Alan handled the myriad of details that needed handling with the car, I (James) started working on transferring gear from the old timing stand to the new stand. We used the old one, one last time on Sunday, and will use the new one for the first time next week at Bonneville. As you can see, the new one is slightly taller than the old one, and has the added advantage of being able to be towed by a large pickup, rather than a big-rig. Sunday morning, after setting up the timing traps, Alan and Mark got ready to run. With the 16/40 gear ratio we were using, it was planned to keep the car between 8800rpms and 9000rpms to set a record around 170 mph. We were again 6th in the association, so we lined up to run 6th, but for a variety of reasons we actually ran second, after a 80 mph motorcycle. Basically, we had a completely fresh course. When you race on packed dirt, that is a huge advantage. I was listening in the timing stand as the car approached, and it sounded smooth, and powerful the whole run. Bob Opperman, who has raced for 50 years was standing behind me, and commented that it sounded "Flat", meaning not accelerating. A few seconds later we got the speed, 170.512, a new GGL class record. Mark of course, didn't know the speed until Alan pulled up with the push truck, and told him the good news. This run earned us 231 points and moved us up to 5th overall in the SCTA. You can see the haze that Mark was driving into. Our "G" is 1545cc, the g class is from 1520 - 2000cc. It took 4 tries measuring the motor to certify that it was big enough to run in the G class. Later, we checked the car's onboard data computer and discovered that Mark had reached 170mph in well under a mile, meaning that he had "sandbagged it", (intentionally ran slow) for more than a third of the 1.3 mile track. No wonder it sounded flat. This means that our motor should be very strong for runs at Bonneville next week. 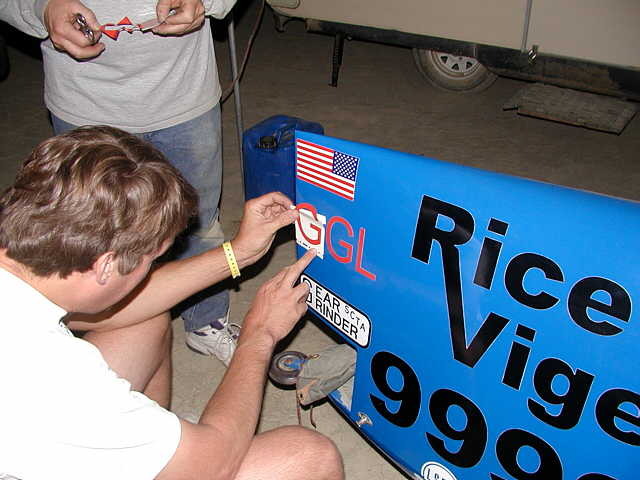 Speaking of Bonneville, Mark's Brother Patrick has decided to lend us a hand while we race there. We have worked with Patrick before. He even raced a season or two on a motorcycle with some of our spare motors. 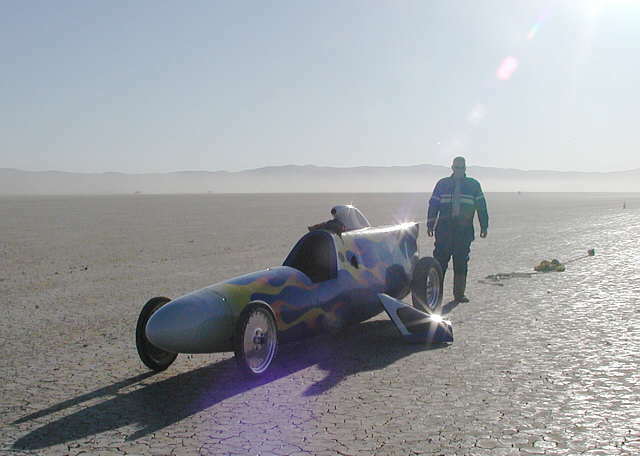 Or plans at Bonneville will be to set new records in the GGL class, around 210 mph. We hope that our "new" bigger motor will do it. The salt and weather conditions look great for next week, except for a little water near the starting line area which should dry up (if not we'll move the course) however, while typing this newsletter, we got word that a fire in the storage lot in Utah destroyed some of the association's equipment, specifically, cones and wire. I am sure everyone who can lend a hand will, and that as much as possible will be borrowed and replaced during the next week. We'll send another Newsletter when we get back from the salt.